Urban VI, given name Bartolommeo Prignano, Roman Catholic Pope from the 8th of April 1378 to the 15th of October 1389, was born at Naples in 1318. He was made bishop of Acerenza in 1364, and in 1377 was translated to the archiepiscopal see of Bari and placed in charge of the papal chancery. 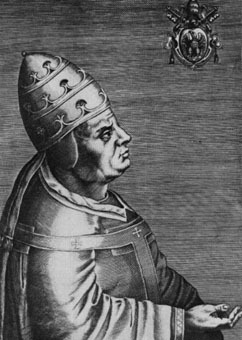 On the death of Pope Gregory XI, who had finally returned to Rome from Avignon, he was elected pope in a conclave held under circumstances of great excitement, owing to popular apprehension of an intention of the French cardinals to elect a French pope and again abandon Rome. The populace broke into the hall after the election had been made and dispersed the cardinals, but the latter returned and confirmed their action on the following day. Urban VI turned his attention at once to the reformation of the higher clergy, and, in spite of the warnings of Catherine of Siena, so angered the cardinals by his harsh and ill-tempered measures that they assembled at Anagni in July 1378, and revoked his election, in which they declared they had acted under fear of violence. On the 20th of September they elected at Fondi the Cardinal Robert of Geneva, who called himself Clement VII and took up his residence at Avignon. Urban, on the other hand, remained at Rome, where he appointed twenty-six new cardinals and excommunicated Clement and his adherents. Thus began the Great Schism which divided the Western Church for about fifty years. Urban deposed Joanna of Naples (21st of April 1380) for adhering to France and Savoy in support of the antipope, and gave her kingdom to Charles of Durazzo. Charles was crowned at Rome on the 1st of June 1381, but three years later quarrelled with the pope and shut him up in Nocera. Urban succeeded in escaping to Genoa, where he put several of his cardinals to death for suspected disloyalty. On the death of Charles he set out with an army apparently to seize Naples for his nephew if not for himself. To raise funds he proclaimed, by bull of the 11th of April 1389, a jubilee for every thirty-three years, but before the celebration could be held he died of injuries caused by a fall from his mule. Urban was frugal and never practised simony, but harshness, lack of tact, and fondness for unworthy nephews disgraced his pontificate. He was succeeded by Boniface IX.